Most fires start in the kitchen and NFPA®'s Cooking Fire Safety Brochures are the recipe everyone needs to wipe the kitchen clean of fire and injury! With cooking fires being the #1 cause of home fires and home fire injuries, the nearly two dozen tips inside these new Cooking Fire Safety Brochures can help prevent scalds and burns...help prevent potholders, towels, and clothes from catching fire...help prevent electrical fires and fires in the microwave...and help reduce the risk of shock. With these Brochures in-hand the people in your community can be more aware of how to improve cooking safety -- and discover what to do (and not to do!) to avoid stirring up trouble. 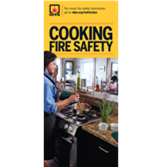 NFPA® Fast Facts about cooking fires help drive home the fire safety message! Why to never leave the kitchen while cooking even for a short time! Keep kids, pets, and flammable items away from cooking areas. How to set up a safe "kid-free" zone in the kitchen. How to properly handle pot handles, hot foods, and liquids. What to do if there's a cooking fire and proper steps to take.